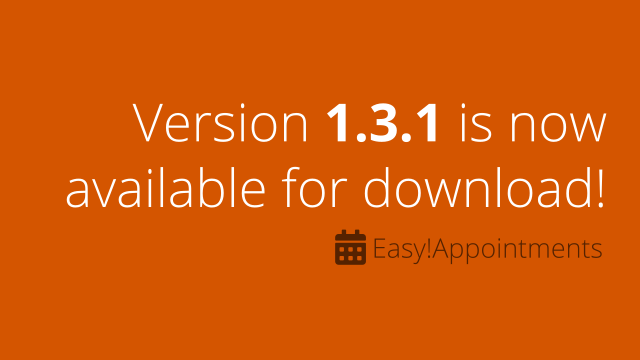 Easy!Appointments v1.3.1 is available for download! A new version is available for download, with many fixes and improvements. #452: Provide more information when errors occur during the installation. #440: Correct label text for customer phone number in back-end calendar event popup. #461: Invalid working plan parsing for foreign languages on day view of the default calendar view. #475: Booking page date selection is broken with any_provider option selected. #483: In backend, calendar for providers become unselectable if switched to calendar for service. #491: Replace hardcoded string with translation in appointment details email template. #495: Database migration fixes (from 1.2.1 to 1.3.x). #497: Backend settings are not being displayed on page load when the user is not an admin.